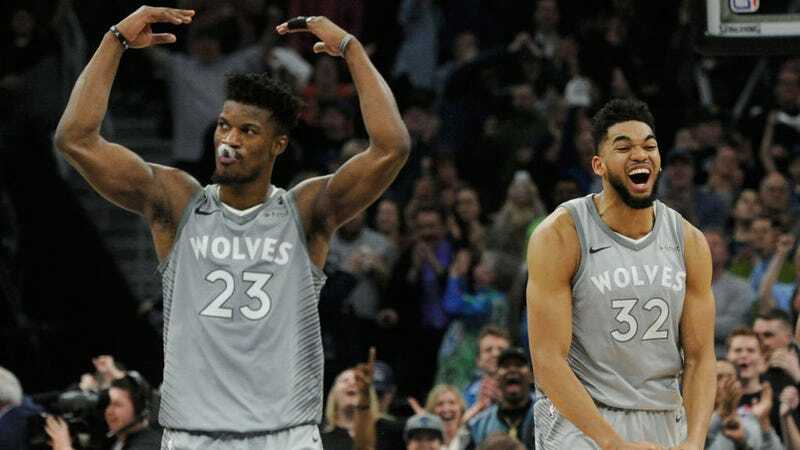 The story here is less that Jimmy Butler turned down a four-year, $100 million extension offer from the Minnesota Timberwolves than it is that the Minnesota Timberwolves thought there was any chance in hell that Jimmy Butler would agree to a four-year, $100 million contract extension, in the same summer in which Zach LaVine got $78 million, and Devin Booker signed an extension worth more than $30 million per season. Just to recap: Butler was traded away from the Bulls before last season, for a package featuring LaVine, Kris Dunn, and the pick that would become Lauri Markkanen. Butler made All-NBA in 2017, and again in 2018, and if he’d stayed with the Bulls until the end of his contract, which expires following next season, he would’ve been eligible for a designated player maximum contract worth more than $200 million. As an unrestricted free agent in the summer of 2019 he’ll be eligible for as much as $188 million over a five-year deal with the Wolves, or something like $140 million over four years anywhere else. He may not get that much, but he is for sure one of the few perimeter players in the NBA who is genuinely worth max or near-max money. Extensions, though, aren’t necessarily meant to reflect the full market value of a given player. The motivation to sign an extension, before a player hits free agency, is to mitigate risk, on both sides. The team wants to lock up a good player before he can be wooed someplace else in a summer frenzy; the player wants the security of locking in long-term money without running the risk of a career-altering injury in a contract year. Butler is a tough, durable player, but he’s only played more than 70 games twice in his seven-year career, and that combined with his relatively late arrival in the NBA (he was a 22-year-old rookie after playing four years of college ball), could give him some incentive to favor the security of a long-term extension in a favorable basketball situation. It’s worth it for the Wolves to see if Bulter would give them a slight discount now in exchange for locking in a ton of money, in order to avoid playing out a contract year in his age-29 season. But a $100 million extension (or $110 million, depending upon the source) is a hell of a haircut for Butler to take considering what he stands to make in free agency, and especially since the league-wide corrective trend towards frugality dominating this summer’s free agency period is setting 2019 up as another potential bonanza for players. Butler’s torn meniscus, suffered in late February, might change the math of what Butler could’ve expected to pull in this summer, but Butler made it back in time for the playoffs, and produced well enough in their five-game loss to the Rockets, and whatever lingering effects carried over from the time missed weren’t even close to the top of the list of what doomed the Timberwolves in that series. And, anyway, he isn’t a free agent facing this summer’s buyer’s market. Next season should be vastly more player-friendly, and another typical season from Butler would keep him in line for a payday that dwarfs this relatively limp extension offer. Butler bet on himself in 2014, turning down a four-year extension with the Bulls, and made himself another $45 million spread over a four-year max deal. He’s made two All-NBA teams and four All-Defensive Teams in the years since. It should surprise no one to learn that that experience has not convinced him to start doubting his worth. Is That Really All The Bulls Could Get For Jimmy Butler?